As has been reported in the Star Ledger and elsewhere, Councilman Jim Bean’s ethics complaint has been referred to the Statewide Sandy Fraud Working Group in the state Attorney General’s office for criminal investigation. Interestingly, it was AshBritt and Ferreira that were the only two companies that could have been chosen that would have caused all these conflict of interest problems. Out of all the possible contractors that could have been called, it was those two we should have stayed away from. But those were the two we called. While the AshBritt story has been getting the most attention in the media, it is the situation with Ferreira that has the potential to create an even bigger headache for the mayor. 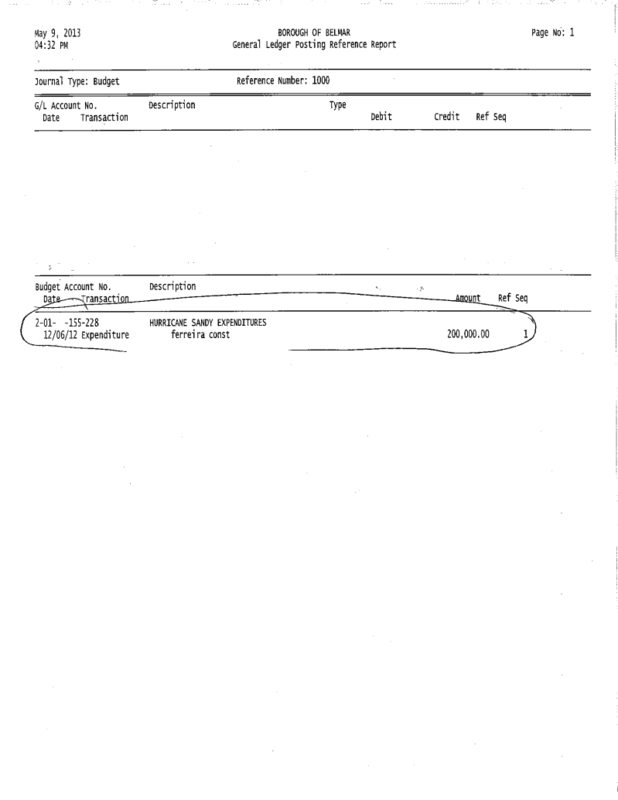 Not only is there the same conflict caused by them being a client of the mayor’s wife, he also took a $2600 campaign contribution from them during his 2010 mayoral race that was $2300 higher than the legal limit specified by Belmar ordinance and most of it had to be later returned. 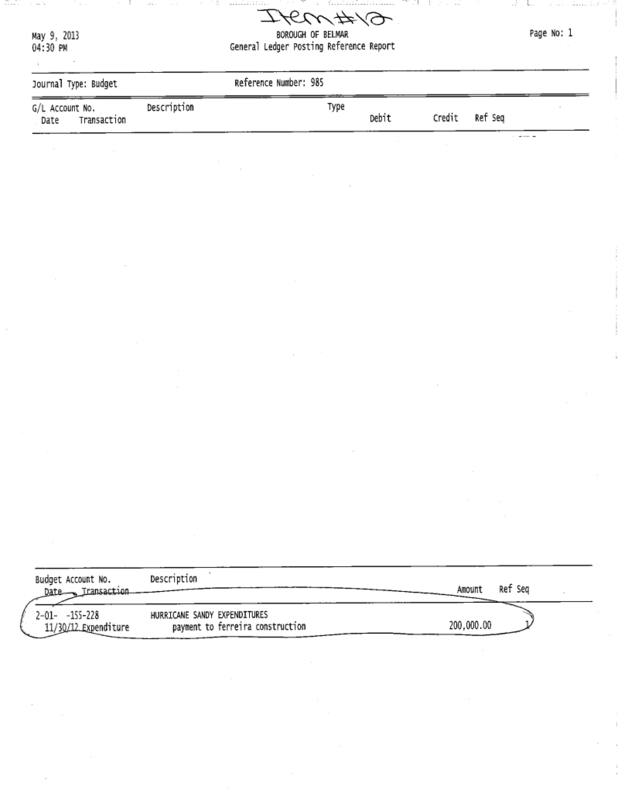 And although the Star Ledger reports that Ferreira was paid $749,000, the actual amount paid to Ferreira as of February 21 was closer to $1 million. Now it may interest some of you to know that the day after the storm hit is was Ferreira Construction, not AshBritt, that got the call to start hauling out debris from the storm. 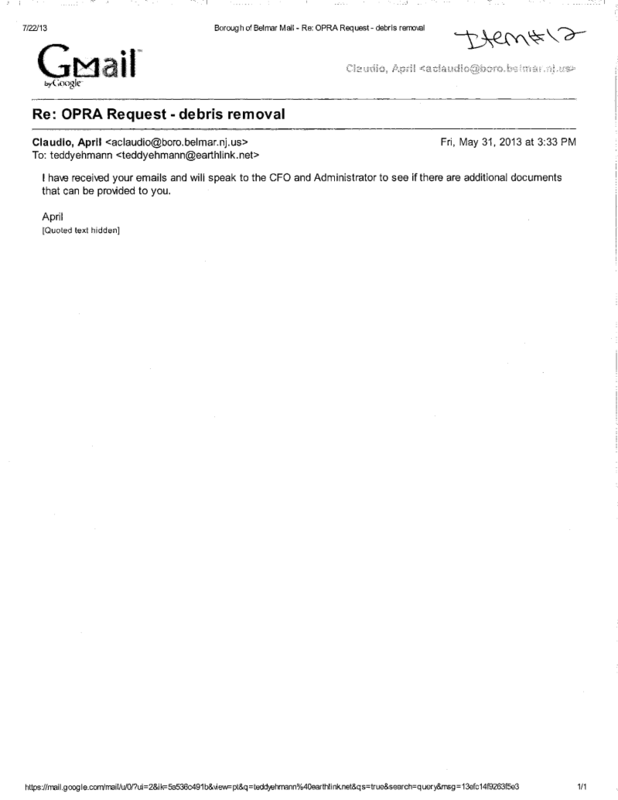 This was before AshBritt, by piggy-backing onto a 2 year year old contract made with Connecticut, was named as one of the state approved contractors for Sandy-related debris removal. It was also before Maggie Moran, wife of Mayor Doherty, signed her marketing contract which would partner AshBritt with long-time Moran associate Conti Group. Previously, AshBritt had no presence in the Garden State. Now they could call her office in Lake Como home during the critical early weeks, and have the state League of Municipalities direct inquiries from storm-hit towns directly to her email. It came as little surprise to many that Belmar was among the first towns to ink a no-bid deal with the AshBritt-Conti consortium. 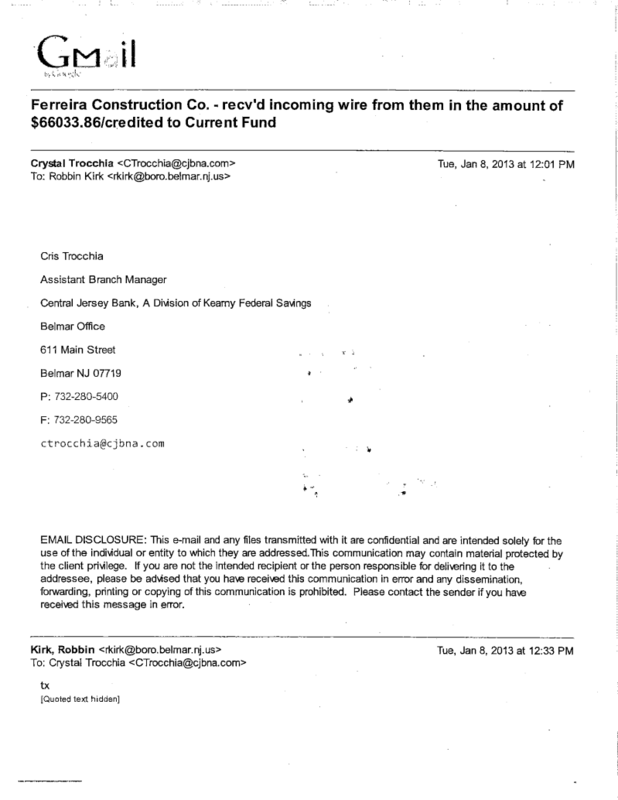 Under state law emergency contracts like this might be legal although it certainly didn’t look good and the affair received quite a lot of press attention. 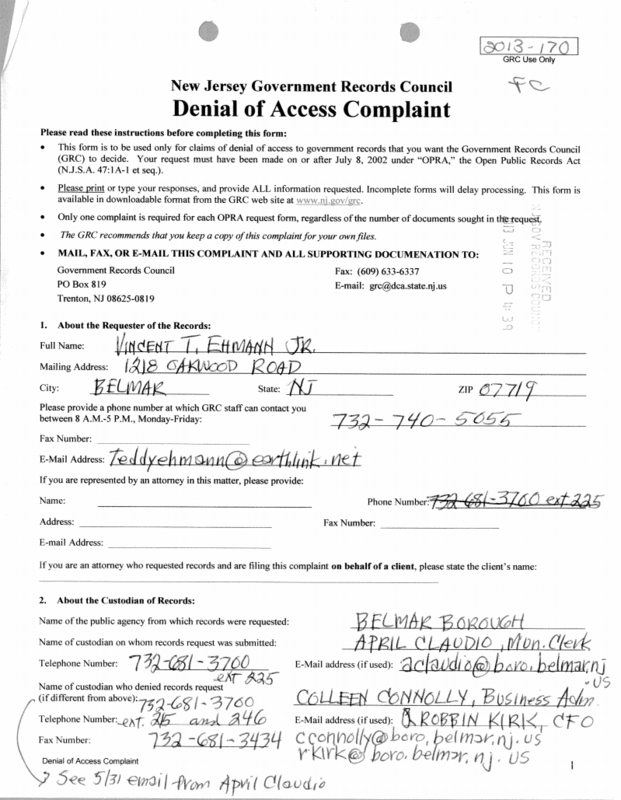 (Belmar’s pay-to-play law has no such emergency provision.) The mayor says he had nothing to do with choosing AshBritt, that then-borough administrator Bill Young made the decision. Not a lot was written however about Ferreira’s participation, and in my opinion it bears a closer inspection. 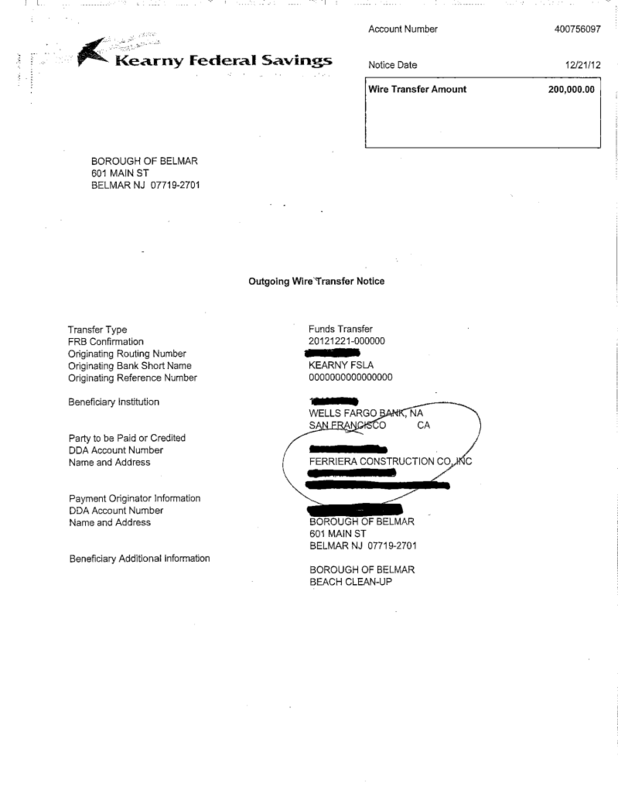 This is particularly true in light of the fact that while the contract for, and invoices from Ferreira have all appeared on the borough’s web site, Ferreira’s name never to this day has appeared on any borough payment of bills lists. 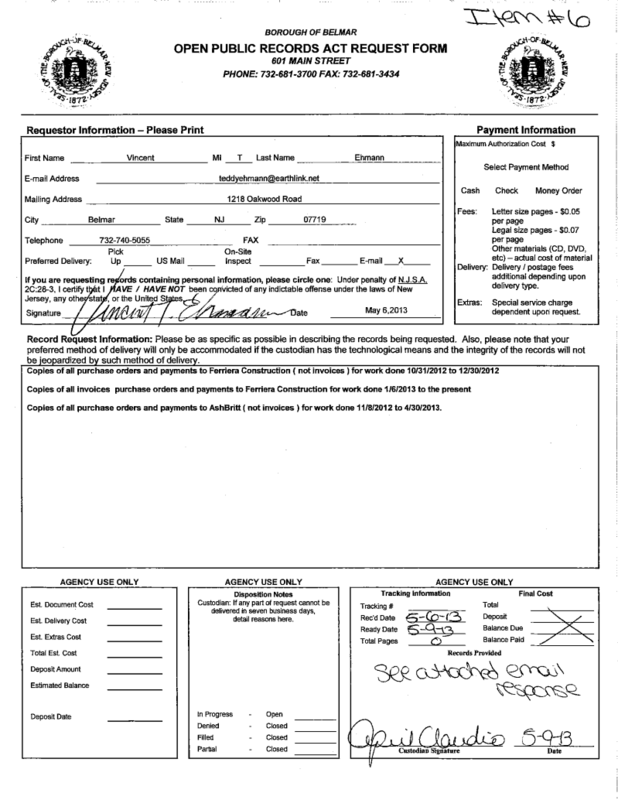 Their name, along with AshBritt’s was included in two resolutions authorizing the appropriations for the clean up, and the mayor recused himself from votes on those resolutions, but he never had to recuse himself from voting to actually pay Ferreira for services rendered because the payments were kept hidden from the public and even from the four members of the borough council. For even the most controversial spending, both Sandy-related and not, the town has used standard municipal accounting procedures, grouping invoices, issuing purchase orders that require signatures, and cutting checks. We might not have liked what was done, but at least the information was all available to us. One citizen who has made it a pastime to examine the storm-related spending noticed something peculiar. 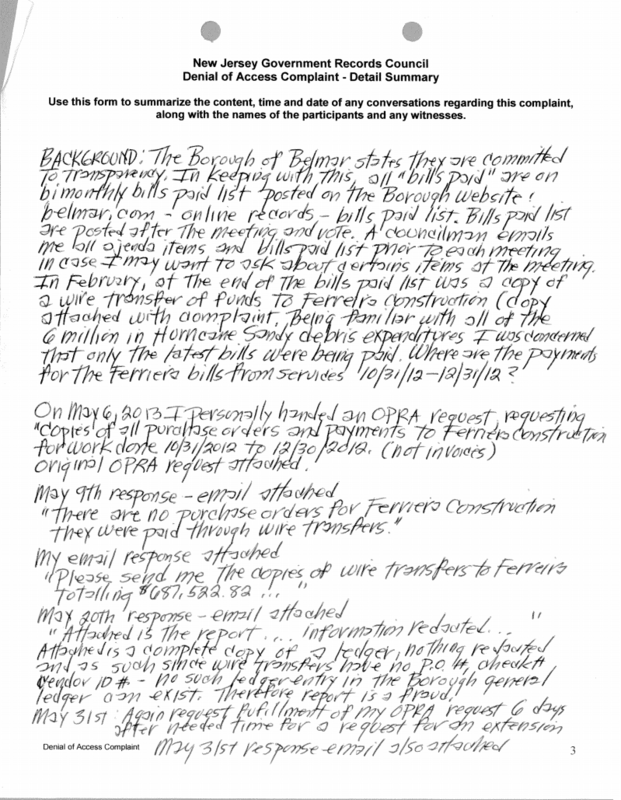 Ted Ehmann, who has been keeping track of all the contracts, invoices and payments saw contacts for Ferreira, saw invoices from Ferreira, indeed saw Ferreira’s trucks doing the work, but in all the payment of bills lists never did Ferreira’s name appear! Why weren’t we paying them? 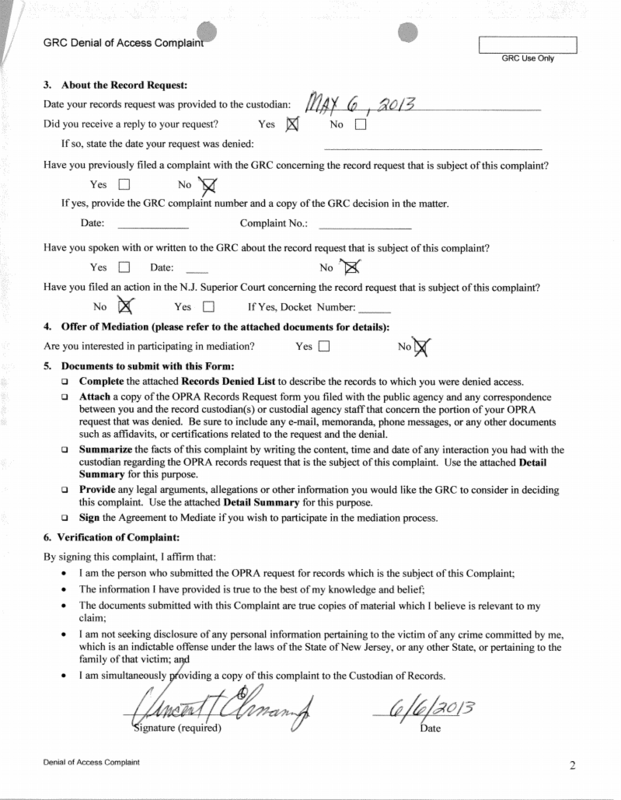 Ted decided to find out why and filed an Open Public Records Act (OPRA) request on May 6, 2013 to get the information. 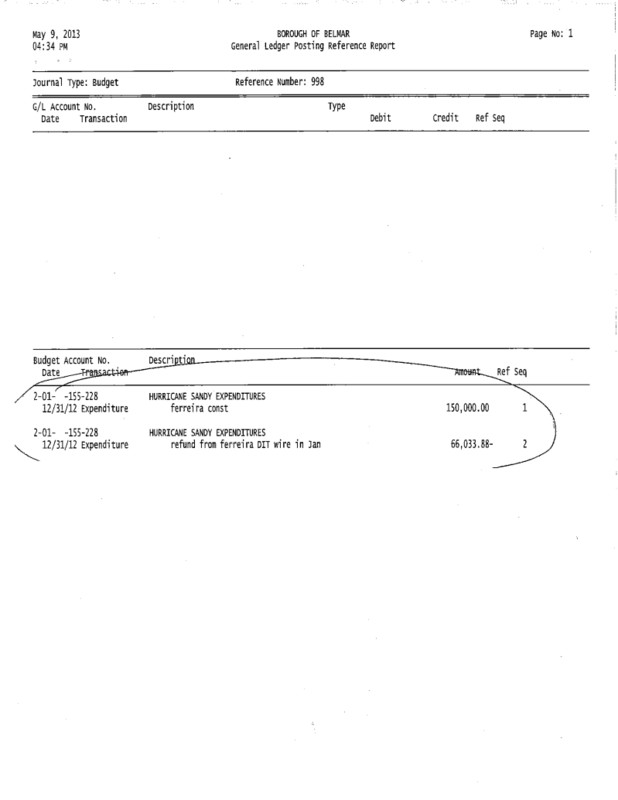 So Ferreira was paid by wire transfer. There were no POs and no checks. 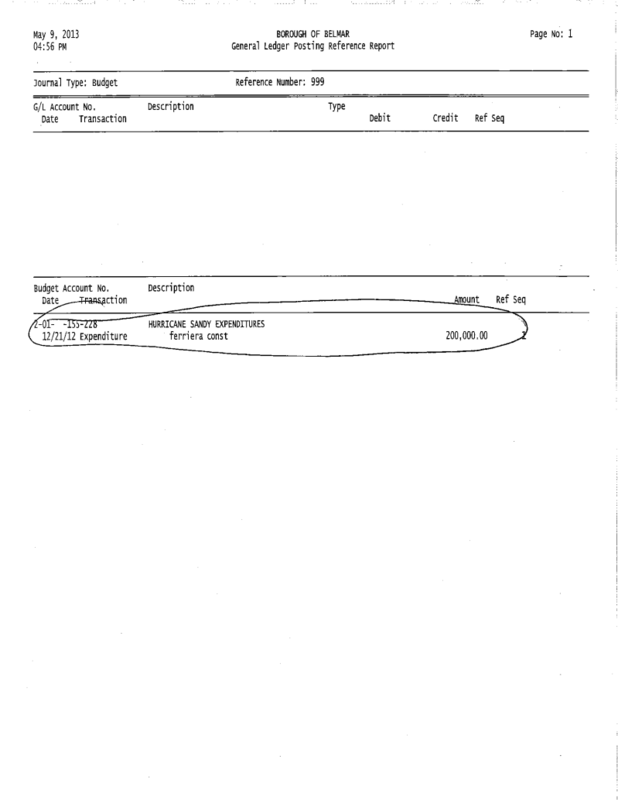 But Ms. Claudio’s response had no information about which invoices were paid, the amounts paid, or dates on which they were paid. 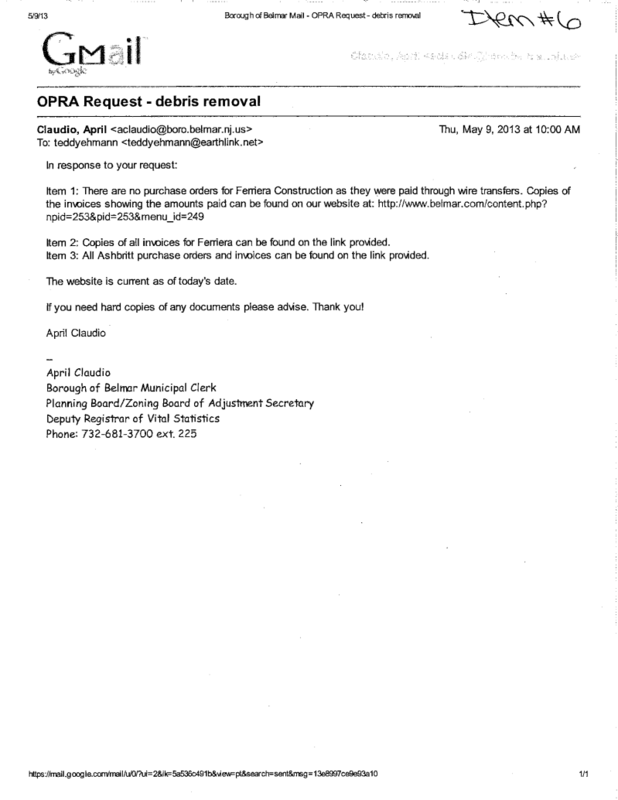 To which Ms Claudio replied on May 20th, 14 days after the original OPRA request. 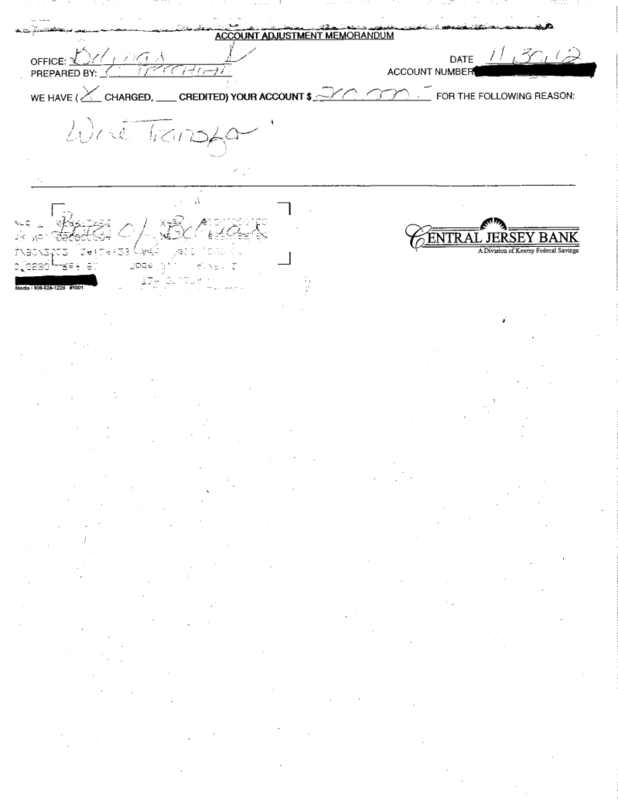 She states that on these ledger entries that Ferreira’s banking information has been redacted, but actually no such information is even on the documents. 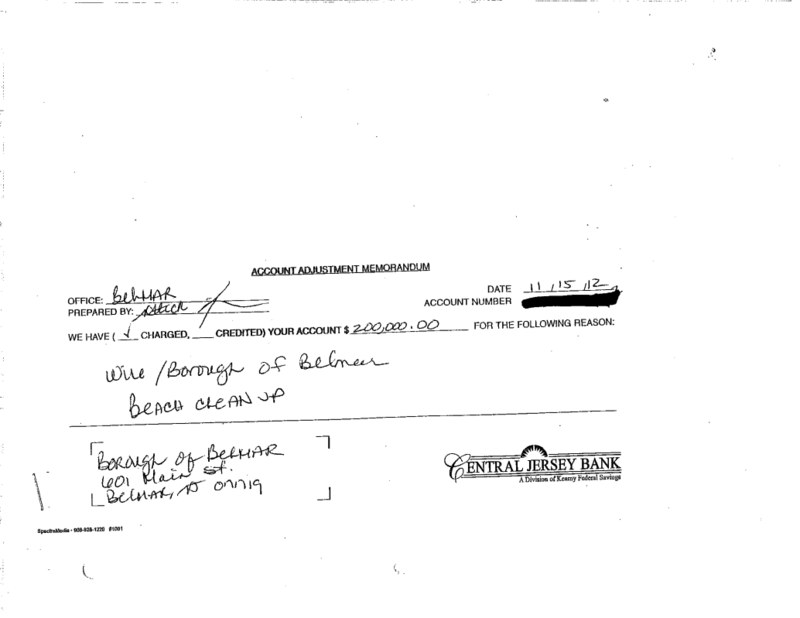 Since the ledgers do not qualify as actual copies of payments, in his next email Ehmann requested actual copies of the wire transfers. 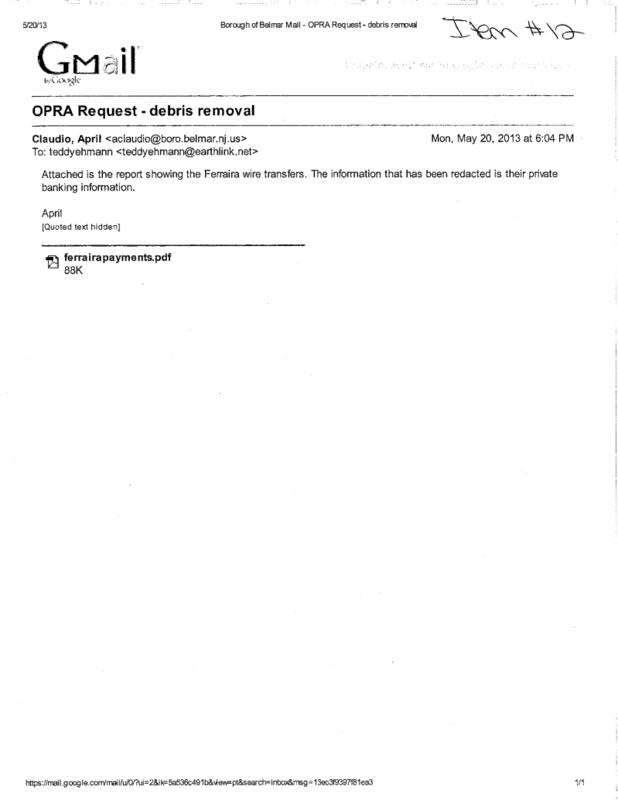 Ms. Claudio responded that she will check with CFO Robbin Kirk and administrator Colleen Connolly. 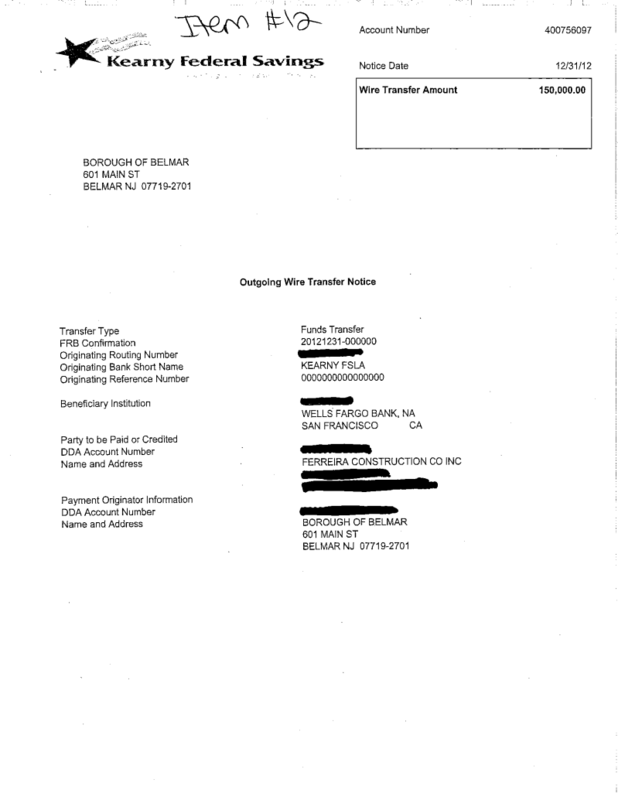 Finally, on June 17th, Belmar sent the copies of the wire transfers that were originally requested in early May. 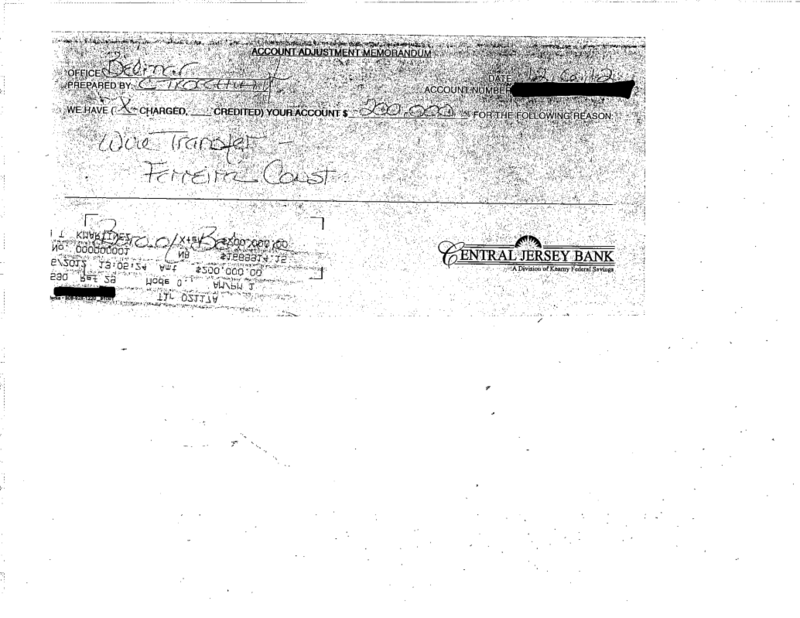 Note the $66,033 refund sent back to us on the same day we sent Ferreira $150,000. Apparently we overpaid them by that amount. This is why several invoices should be grouped together and a purchase order should be issued prior to making payments. 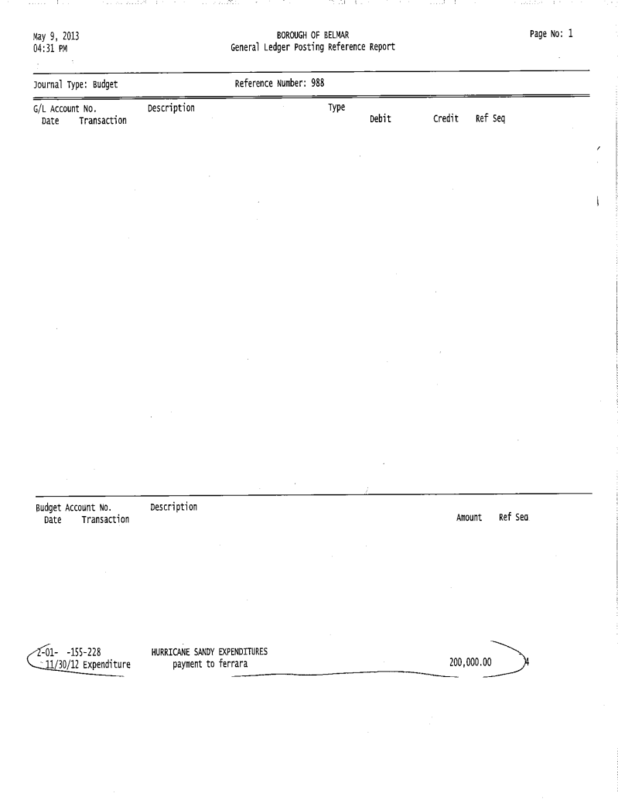 It looks to me like we were just shipping them buckets of money not tied to any particular invoices. Very easy to make mistakes that way. Ms. Claudio’s response to the Records Council as to the legal reason why the records were not promptly supplied was that she couldn’t get them from CFO Kirk. 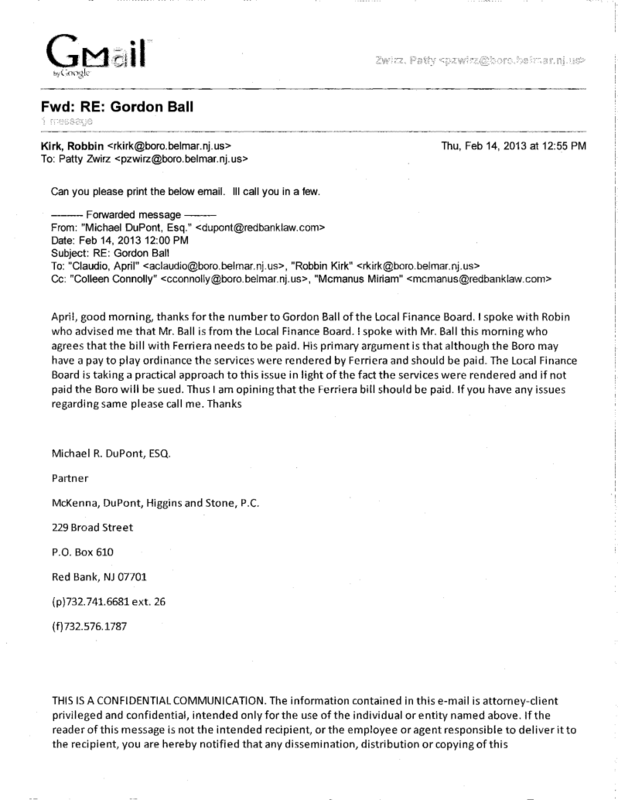 I assume that the state Attorney General is looking into why Ferreira, considering all the complications stemming from the pay-to-play aspect and additionally Ms. Moran’s connection to them, was chosen for the lucrative no-bid contract immediately after the storm. But appearance of impropriety is magnified when one considers that the administration chose to pay them in a such a way that no information about the payments was available to anybody on the council or the public at large. It took the dogged determination of private citizen Ehmann to bring this to my, and now your, attention. I have a couple of questions. 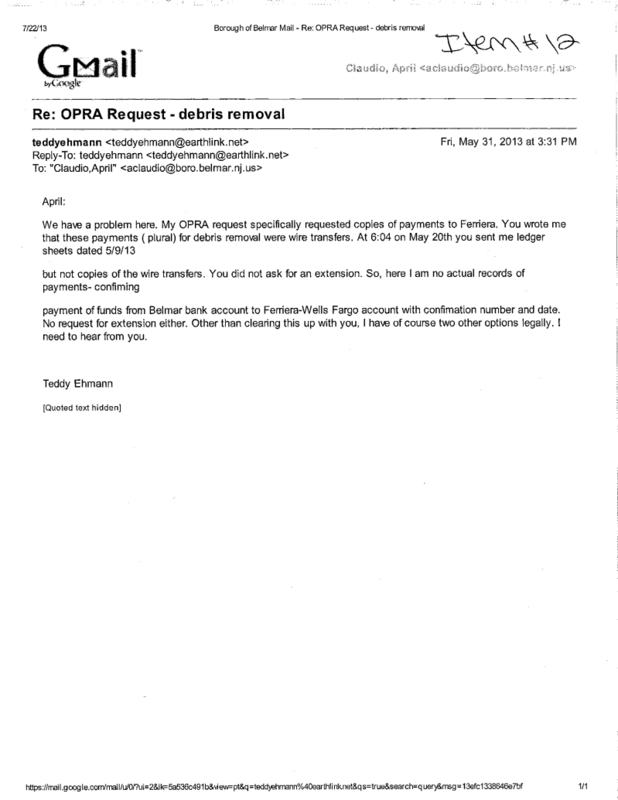 Does the town’s CFO have to sign off on wired money transfers? 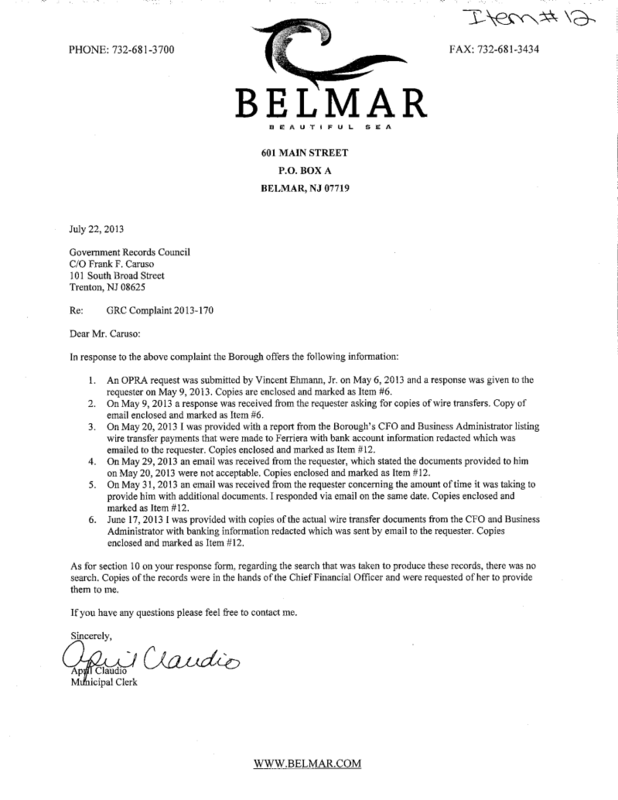 Since Belmar’s pay to play ordinance has no exemptions for states of emergency, was the use of wire transfers a way to get that money to Ferreira without the CFO’s assent, if CFO Robbin Kirk did in fact refuse to sign off on these payments because of Ferreira’s donation and our pay-to-play law? Is that the reason for this email from DuPont? So does the administration have the legal right to spend nearly a million dollars with no signature from our CFO, no vote by the council, and no information about it released to the public? Something doesn’t seem right about this. cake. What happened to the investigation?